CD review: "Word of Mouth"
This review first appeared in the January 22, 1995 issue of The Daily Aztec. With the continuing decomposition of the talents of The Kinks' lead man Ray Davies, as evidenced on "One for the Road," "Give the People What They Want" and "State of Confusion," it seemed that the band was destined to fade into the sunset as they moved into their middle years. However, Davies and Co. have risen from the dead with their latest release, "Word of Mouth." This new venture from the one-time rock gods contains enough fresh, rocking material to satisfy the most discriminating Kinks fan. There are no anemic "Come Dancing"s on this album; nor are there any re-writes of their own old classics, like "Destroyer" (an obvious rip-off of "All Day and All of the Night." Instead, there are driving rockers like the first single, "Do It Again," and "Sold Me Out." "Do It Again" is much like two greats from their past, "Catch Me Now I'm Falling" and "(Wish I Could Fly Like) Superman" (both from their 1978 classic comeback album, "Low Budget"). Like the earlier two songs, "Do It Again" starts off slow, and then builds to the chorus. Dave Davies delivers a solid performance on guitar, showing a freshness not heard in some time from him. On "Sold Me Out," drummer Mick Avory gives one of only three performances on this album; on the other tracks, the longtime Kinks veteran is replaced by newcomer Bob Henrit. This song is a hard rocker punctuated by harmonica passages by Ray Davies. Think of how we feel, she didn't say, didn't ask, she just went. 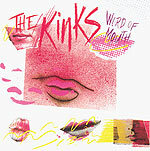 "Word of Mouth" is a great album  The Kinks are rocking with a hard beat and are once again willing to take on social issues in their songs.